This site generates income via clicks and bookings made through links to carefully-curated travel partners. 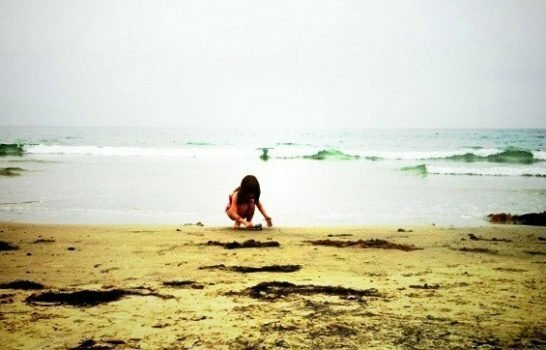 To better enjoy San Diego’s year-round sunshine, many travelers—especially families—factor in a hotel’s pool when booking accommodations. They provide a nice place to unwind after a day at the beach or sightseeing, with a cocktail and/or pools toys in-hand. 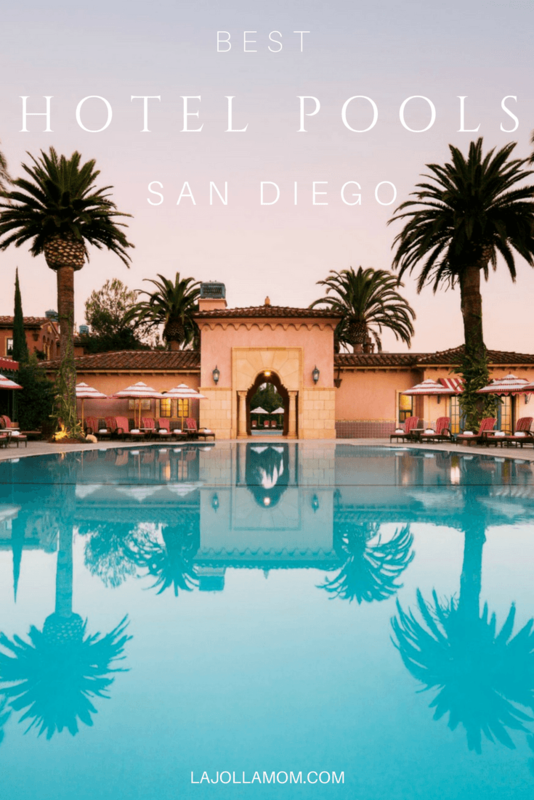 This ultimate list of best hotel pools in San Diego will help narrow your search for where to stay. Since you’re venturing to paradise, these pools are outdoor pools. I’ve broken the selection into four different categories of pools, catering to the vibrant, yet diverse, pool seekers visiting the gem of Southern California. 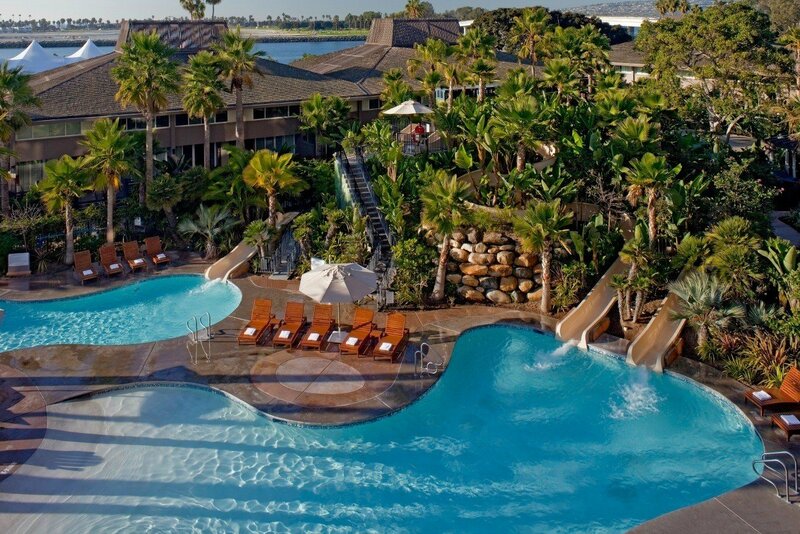 Most San Diego hotel pools are of modest size (we’re known more for our beaches than our hotel pools) but some have waterslides and epic views. Other pool decks are festive places to meet friends. If you’re reading this to find the biggest hotel pools in San Diego, this is the section for you. 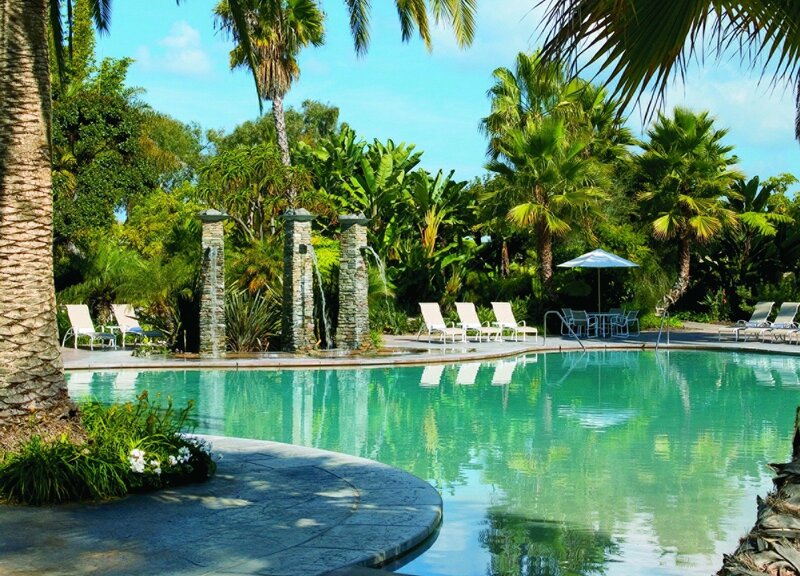 These San Diego hotels rate highly for overall ambiance and the poolside relaxation aspect. It’s important to enjoy your time both in and out of the pool. 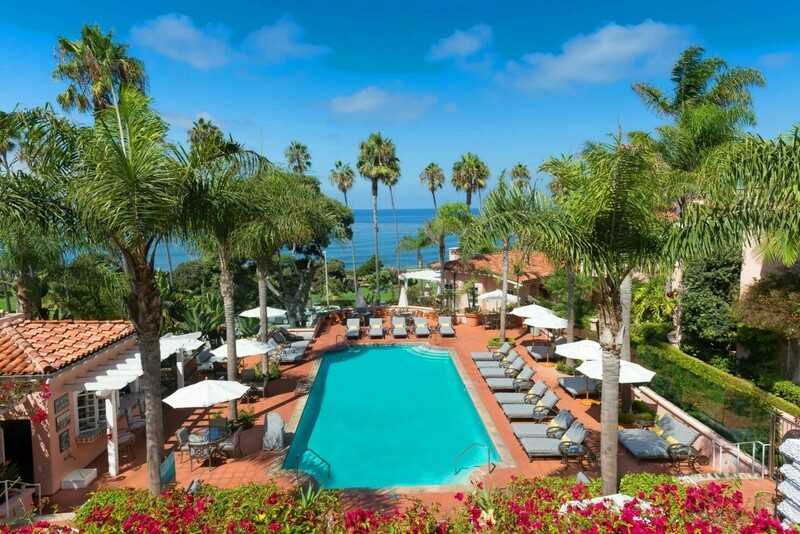 San Diego’s best luxury hotel, Fairmont Grand Del Mar, also has the best pool options. 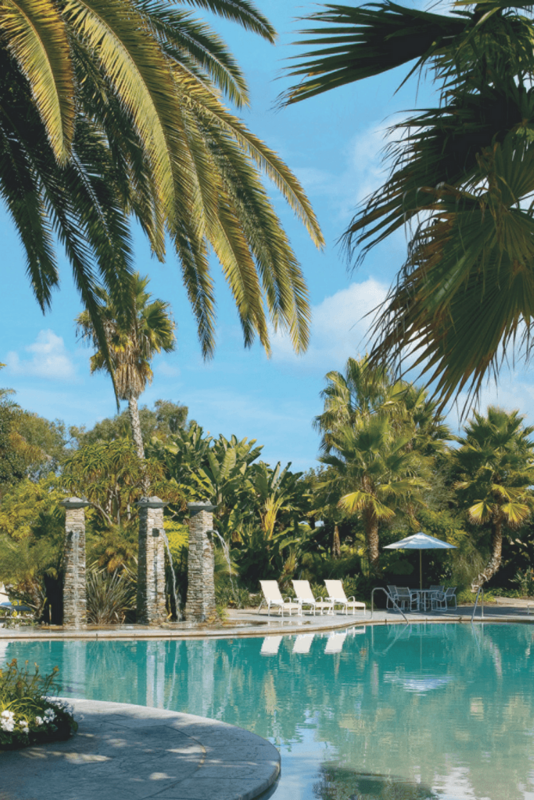 Guests enjoy four spectacular outdoor and heated pools. The main Resort Pool offers private cabanas with TVs, underwater music, towel service and a Pool Bar with drinks and a food menu. The children’s pool with a wading area is also near a white sand area to play in. There is also a Jacuzzi and an adults-only pool that is perfect for relaxation after a spa treatment. The resort’s adults-only Signature Terrace rooms border the pool as well and have terraces that open up to it for easy access. If you’re in search of a luxury hotel with fantastic pools, this is my top pick, and families love it. I can book readers in with special Virtuoso amenities that add value to a stay and may include breakfast for two, an activity credit, upgrades, occasionally a 3rd night free, and more. *If on a mobile device, scroll to the footer of the Virtuoso page and click “Full Site” to access online rates and booking. Only search rates with the number of adults (ages 18 and older) traveling as children may be priced as adults. Mention the number of kids traveling in the notes during the booking process and I’ll add them in. 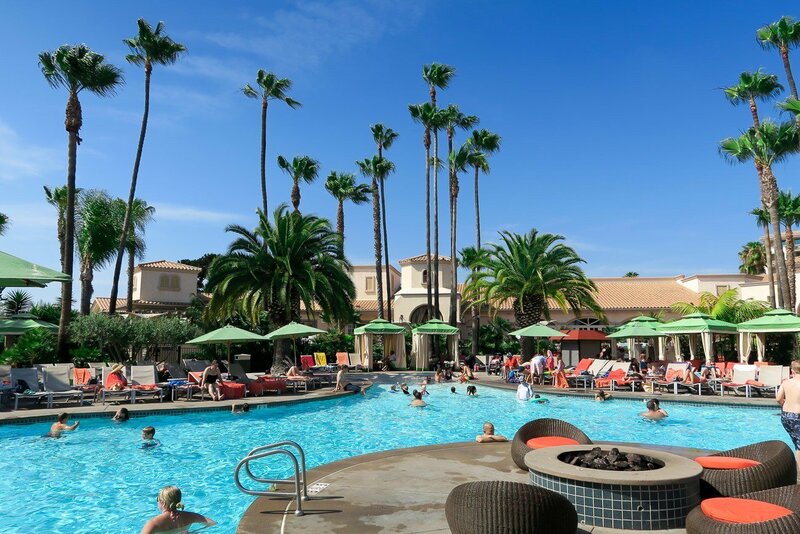 In addition to a world-famous spa, Omni La Costa Resort is also well-known for its multiple pool areas. Adults have their own pool with a golf course view, cocktails and cabanas at Edge. 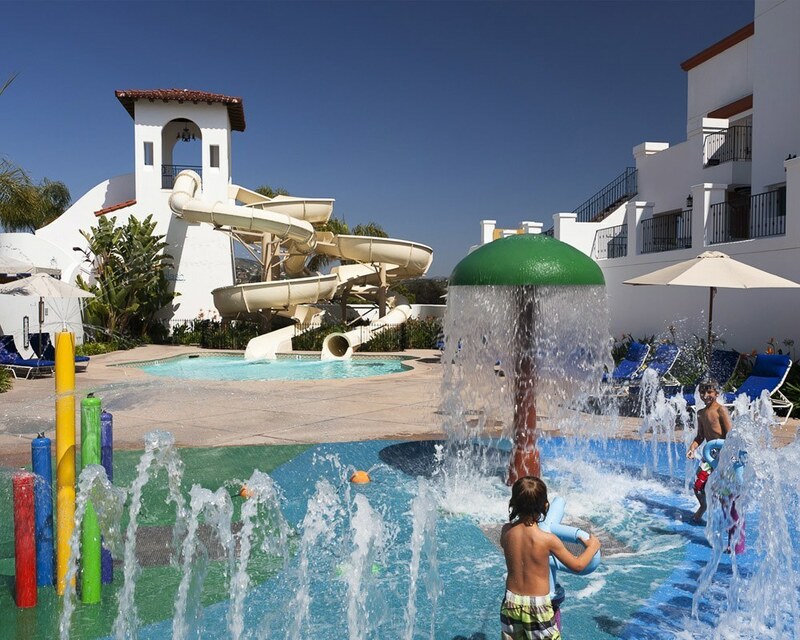 Splash Landing (pictured above) is the kids’ water play area with two 100′ water slides and a cafe area. Nearby is the sandy beach family pool where kids can build sandcastles while parents chill in a cabana. Food and drink service at the family pool is seasonal. 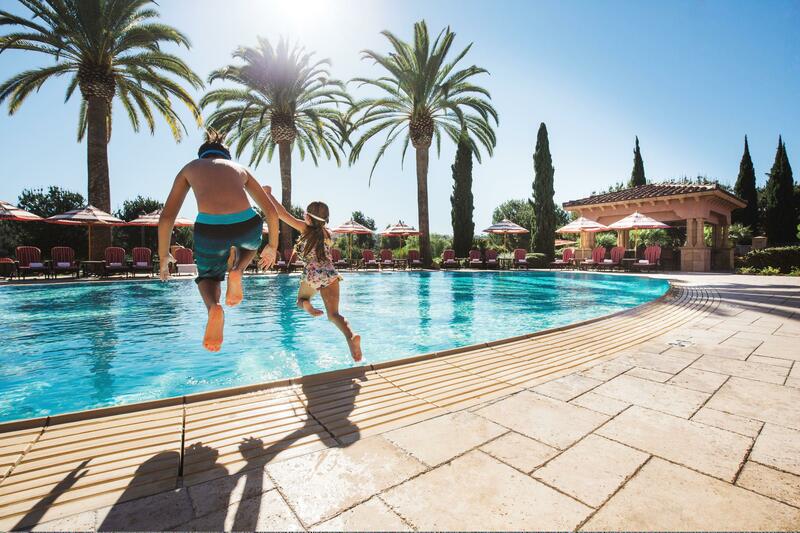 During summer, the resort hosts evening Funtopia family pool parties with kid-friendly fare, s’mores, games and other fun activities. Then, there are villa pools and courtyard pools and, of course, the spa even has its own quiet pool. Note: Pool hours vary based on occupancy and season. A reader I booked in recently reported that the family pool closed at 4:00 p.m. (that’s early) during the second week of April (still spring break for some). 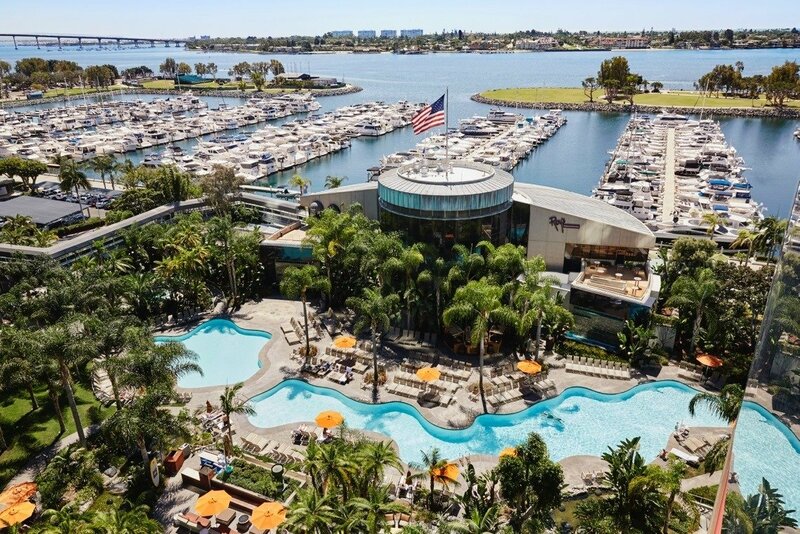 Then the Hyatt Regency Mission Bay Spa and Marina’s lagoon-style pools are hailed as some of the best in town. This resort feature three different pools staffed by a recreation team to help guests with towels, floats, pool games and/or sunblock. The wavy shape gives the grounds a lot of character, spiced with comfortable lounge chairs perfect for relaxing. The evening light here captures an incredible ambiance, especially given the location right on Mission Bay. Prepare for brightly colored arrays spilling across the sky come evening time. 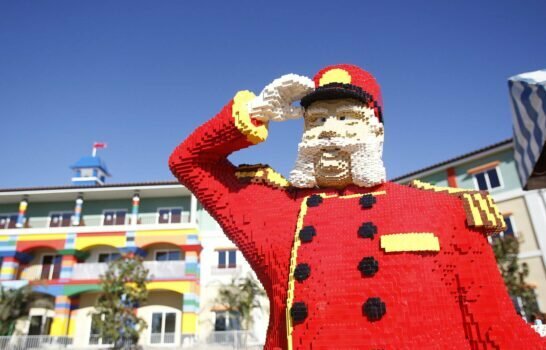 It’s one of the only San Diego hotels on this list to have a separate children’s pool and guests may reserve private pool cabanas. A stay here includes access to a fun, medium-sized turquoise pool combined with seating and umbrellas to ward off the sun. Make sure to check the schedule to see when the pool bar and grill are operating. The Catamaran Resort Hotel and Spa seamlessly blends a charming pool experience with direct access to the gentle waters of Mission Bay. They also provide lounge chairs in the sand along the bay, giving parents the ability to watch kids enjoying a day paddle boarding or sailing. The ocean beach is only a short two-minute jaunt away. Another large, yet wavy shaped pool resides at the San Diego Marriott Marquis & Mariana. At the base level of this modern hotel, the exceptionally large main outdoor pool weaves its way around the patio grounds surrounded by lounge chairs and with easy access to the outdoor grill. This pool ends near a smaller outdoor pool. The downtown San Diego hotel also has a Jacuzzi, giving guests a perfect place to soak after a full day of sightseeing. Probably the hippest hotel in this list, The Lafayette’s 25-meter-long pool also has the most history tied to it. The pool was designed by former Tarzan and five-time gold medal winner, Johnny Weissmuller. This is why it’s called the Weissmuller Pool. Florence Chadwick also trained here for her record-breaking swim across the English Channel. Always lively, the pool often hosts DJ’s, bands, and events on a regular basis. There is also a cabana for 30 people located at the end of the pool. Many of North Park’s amazing restaurants are nearby, too. 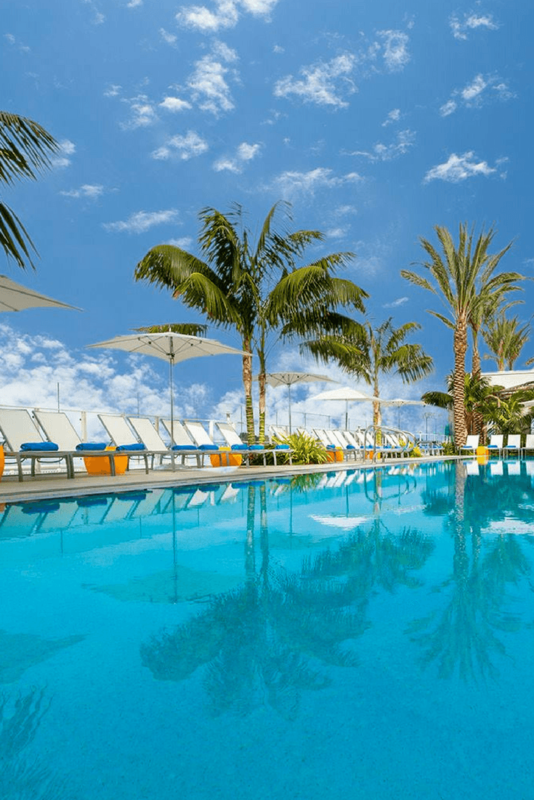 There’s no denying the appeal of San Diego’s 70-mile coastline, but there are beachfront San Diego hotel pools for times we want to alternate between the warm temperature-controlled pool and splashing around in the Pacific Ocean. If you’re looking to embrace both bodies of water, here are the best hotel pools that also give you easy access to the golden beaches of San Diego. Take your sightseeing to a new level at their adults-only spa infinity pool overlooking the boardwalk. There is also an adults-only pool adjacent to the Ocean Towers. Every aspect of your stay at the Hotel Del Coronado is only a minute from walking along the gorgeous Coronado beach. 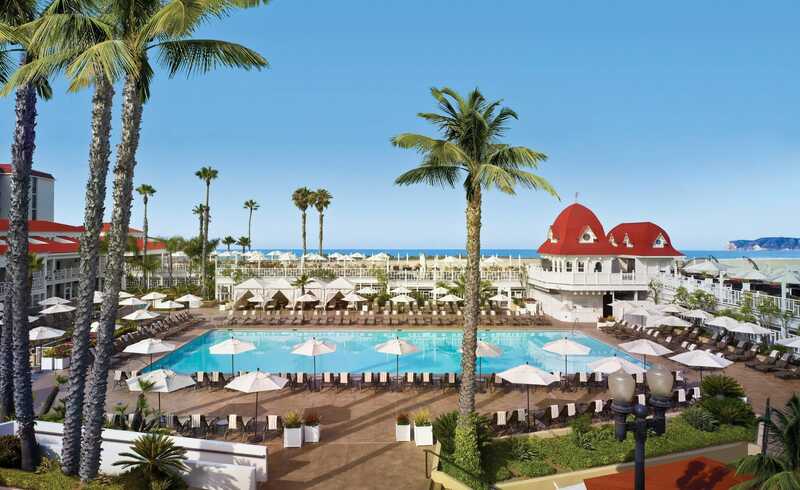 Book Hotel Del Coronado with special perks ($100 spa credit, breakfast for two, upgrade on arrival subject to availability and more) at no extra cost to you through Virtuoso. Alternatively, the Hilton HHonors discount typically saves a little bit (though my Virtuoso benefits typically outweigh this discount). *If on a mobile device, scroll to the footer of Virtuoso.com and click “Full Site” to access online rates and booking. When searching rates, only enter in the number of adults (ages 18 and above) traveling as it may price children incorrectly as adults. Add the number of kids traveling in the notes section during booking I’ll adjust the reservation accordingly. 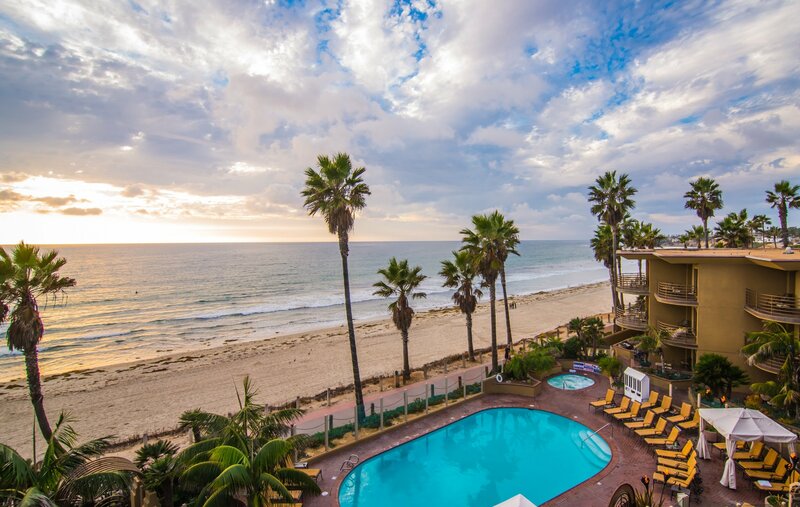 While a much smaller pool, the Pacific Terrace Hotel makes the list due to its incredible proximity along the Pacific Beach shore. 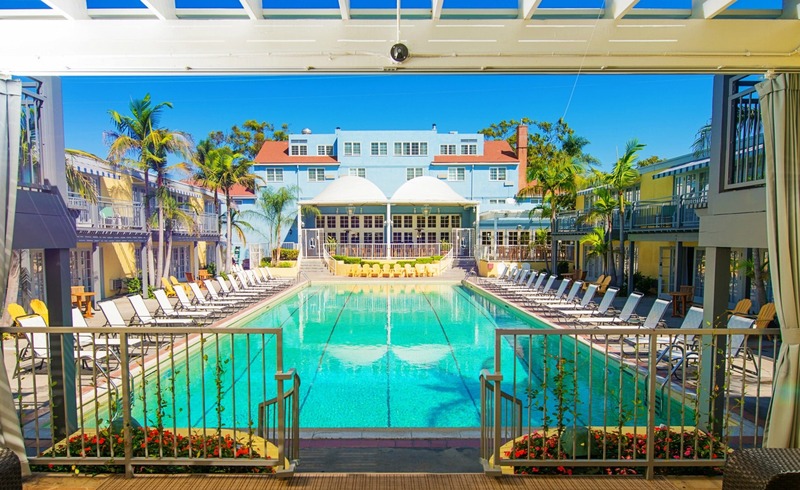 With a prime view of the action on the boardwalk, this pool is ideal for the traveler looking to blend scenic views with an afternoon poolside. This is a highly-rated San Diego beachfront hotel and recipient of AAA Four Diamonds. 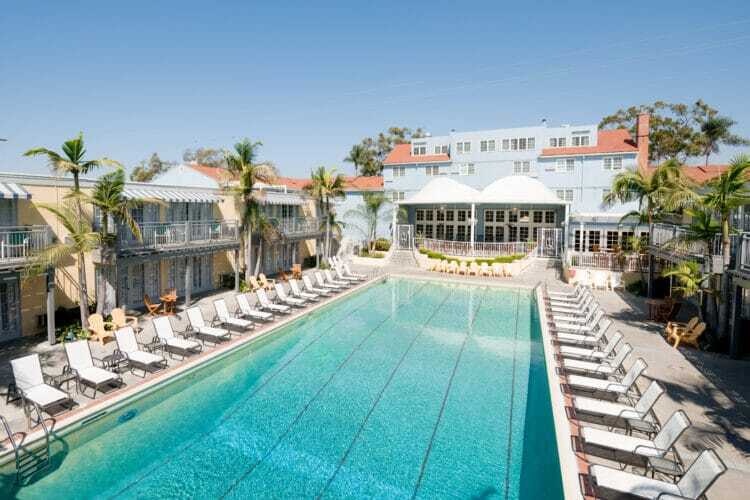 Just steps from La Jolla Cove beach, La Valencia Hotel‘s saltwater rectangular pool blends lavish lounge seating with old-world charm while catering the whole experience around ocean views. 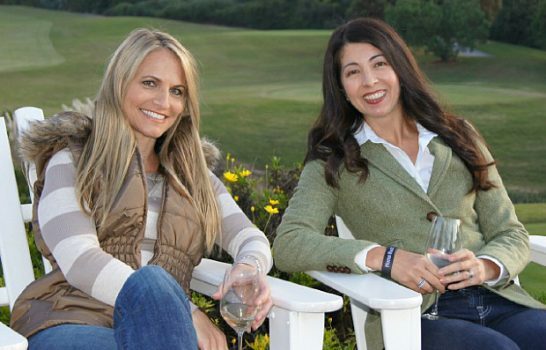 This boutique hotel is La Jolla’s most luxurious hotel with a prime location on Prospect Street within walking distance San Diego’s best restaurants and shopping. San Diego celebrates an abundance of bodies of water. In addition to our endless coastline, we also enjoy beautiful and dynamic bays cutting in along the shore. 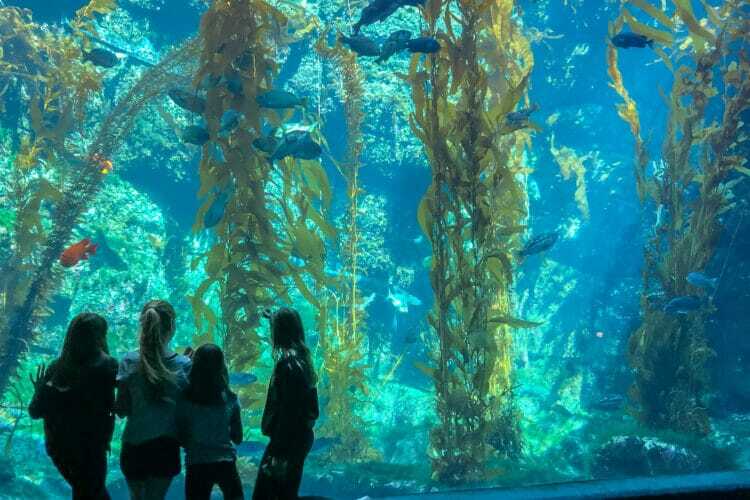 This list includes options both alongside Mission Bay as well as San Diego Bay. 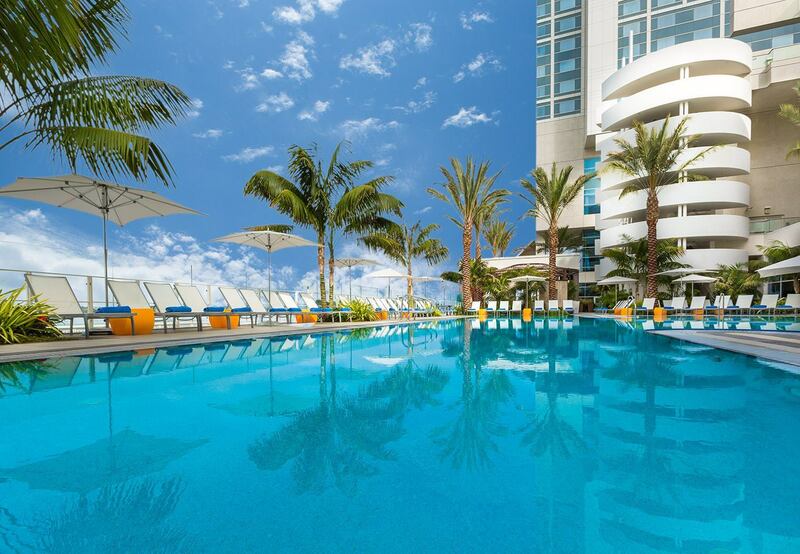 The San Diego Hilton gives you a luxe Miami Beach feel with their bayside pool. Here they take you right to the edge with the patio running into a glass wall where you can look across the San Diego Bay. The experience mirrors that of an infinity pool. It’s San Diego’s only heated saltwater pool. This is also one of the best venues in the Gaslamp area to enjoy the sunset, with unparalleled views of the bay extending to Point Loma. The pool isn’t, huge but the layout and atmosphere make up for what the pool may lack in size. There is also a kids’ water play area with a slide. The Hilton Honors rates are nearly always best for booking Hilton properties like this as they also have a price guarantee. 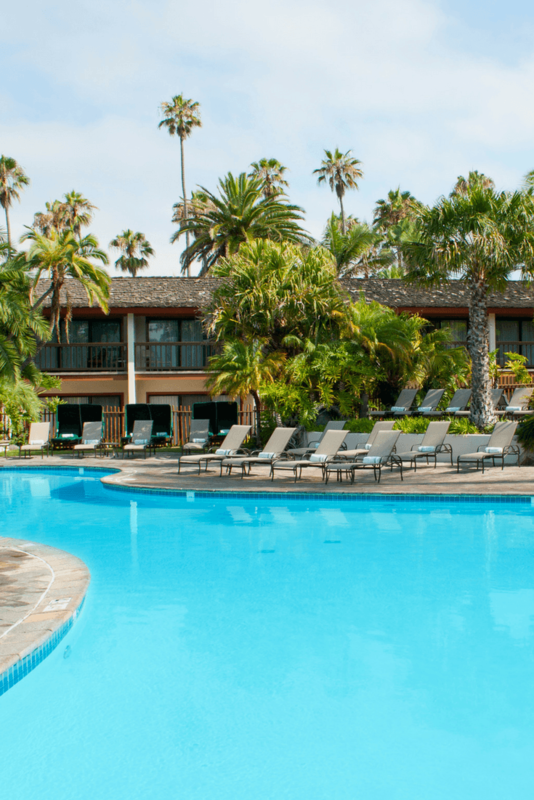 For a colorful, chic, and modern hotel with a pool adjacent to the San Diego Bay, the Kona Kai is the place for you. This small, long pool gives you a front seat to the path where boats navigate to their pier. Comfortable lounge chairs lining the pool and Jacuzzi make for a relaxing poolside experience. Cabanas are available here and also at the adults-only pool. If you’re looking for extra leisure, take advantage of the massages and sauna available at their spa. 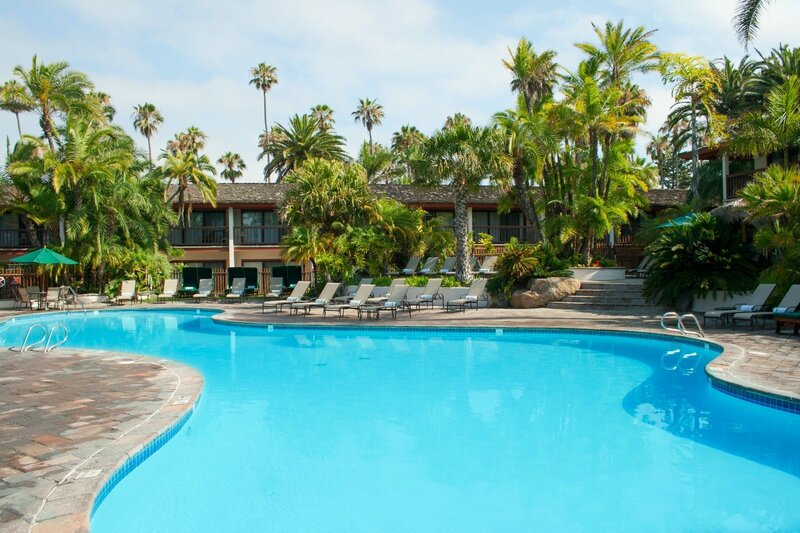 This pool is on the list for people who need a San Diego airport hotel but would like a pool, too. 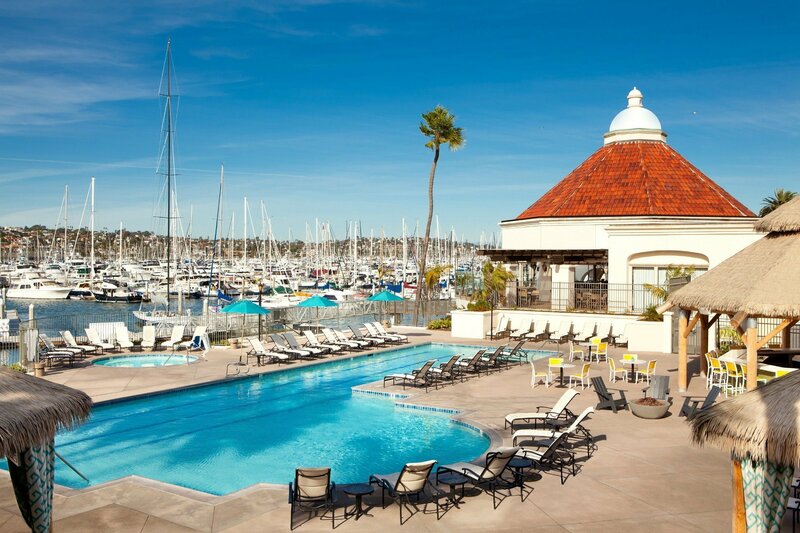 Guests may watch yachts meander through the harbor and enjoy water views at the Sheraton San Diego Hotel and Marina. While a smaller and simple pool, it gives you enough room to splash about. It is the largest San Diego airport hotel with the most amenities including a spa and free 24-hour transfer service to San Diego International Airport. Following the trend of pools wrapping around the patio, the Hilton San Diego Resort & Spa enjoys a wavy pool enclosed in a sea of palm trees. Between the trees you can see Mission Bay peeking through, as well as the sand calling for guests to go for an evening walk. The Hilton also provides a Jacuzzi for guests to enjoy, as well as an on-site spa with nine treatment rooms, an upgraded fitness center, and ample indoor and outdoor relaxation areas. Kids also have plenty to do with Kids Kamp, available to guests at an extra charge. The Hilton Honors rates are nearly always best for booking Hilton properties like this as they also have a price guarantee. Paradise Point Resort & Spa is located on its own 44-acre private island so there is quite a bit to do here including swim in one of the five pools. The pools are all a bit different. Of course, there’s one especially for adults and a larger family pool with chairside drink and food service. The lagoon pool has nearby fire pits for roasting s’mores, the meadow pool, and a waterfall that cascades into another pool. The appeal of a pool isn’t limited to little ones splashing around or to give you a view of the Pacific Ocean. Many of our San Diego hotel pools take advantage of our cityscape through rooftop pools. These create a perfect ambiance for both family-friendly vacations and girlfriends enjoying a bottle of wine together. I’ve included a mix of hotel pools both on the top floor as well as ones that are elevated. Each hotel pool gives you the ability to enjoy our captivating city skyline while lounging at a classy San Diego hotel pool. The rooftop pool at the new Pendry San Diego provides the perfect mix of a chic experience with an old-school touch. 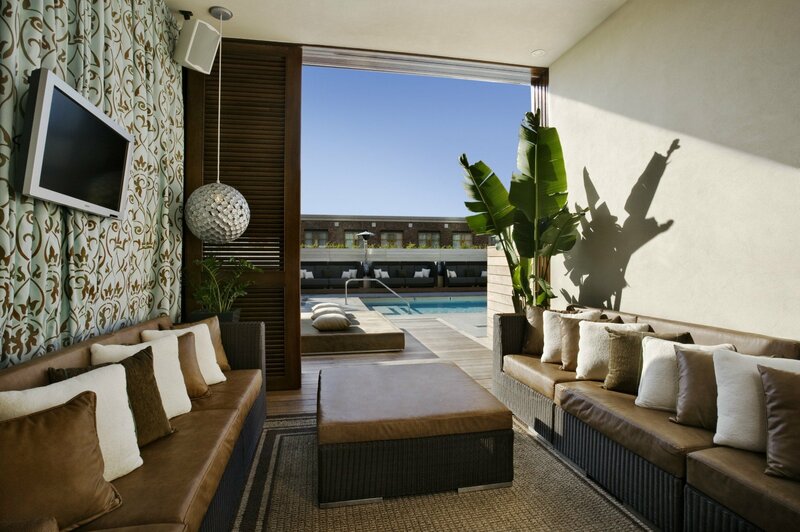 This elongated pool with gorgeous seating including cabanas overlooks the hub of the Gaslamp District. Luxurious lounge chairs with brightly colored striped umbrellas give the final touches on this San Diego pool experience. The Pool House at Pendry San Diego also serves cocktails and bites to poolside guests. Amenities that I can secure for you at no additional cost include breakfast for two, a room upgrade based on availability at check-in, a $100 hotel credit and more. *If on a mobile device, scroll to the footer of Virtuoso.com and click “Full Site” to access online rates and booking. Kimpton Solamar Hotel raises the bar (literally) when it comes to poolside lounging. 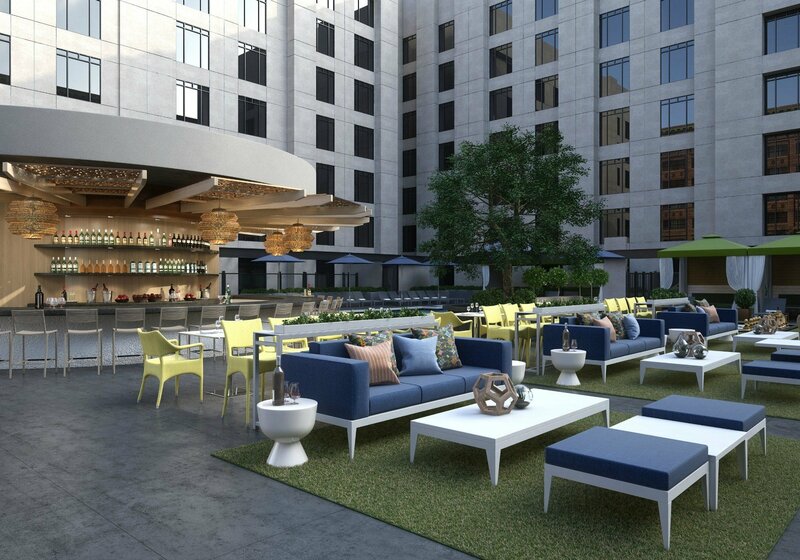 The modern vibe of the hotel extends to the patio which is now the revamped Upper EAST Bar (pictured above). 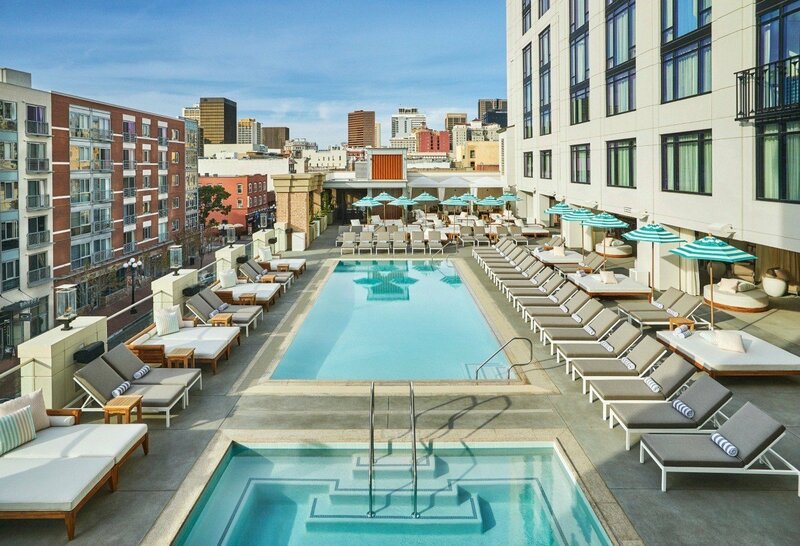 While it’s a smaller pool than some of the others on this list, a stay here is more about the elevated and modern ambiance complete a with a happening poolside experience in the heart of San Diego’s Gaslamp district. This long, narrow pool gets you closer to the star-filled skies as the Hard Rock San Diego takes the experience to the roof. Also embedded into the core of Gaslamp, the true appeal starts after dusk when the city lights brighten the skyline. Continuing the sleek, modern feel of the Hard Rock San Diego, the pool deck showcases a contemporary experience with cabana lounging. Take advantage of The Rock Spa, which provides a variety of treatments that can be performed within a poolside cabana. Planning a trip soon? Make sure to look at what to pack for San Diego. 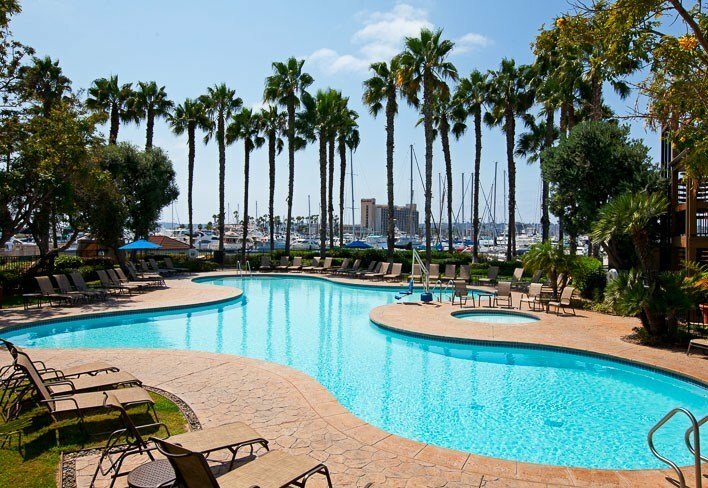 What do you think is the best hotel pool in San Diego?